“To be a La Jolla surfer in the ‘50s,” wrote surf journalist Bruce Jenkins, “meant you never held back: in your drinking, your partying or especially your surfing, where the test of skill was a double-overhead day at Windansea. Nobody savored that life, or typified it more, than Patrick King Curren. Importantly, Curren began shaping. “I worked with Al Nelson and Dave Cheney, building boards for people we knew,” Curren recalled. “This was before stickers. We used a rubber stamp, ‘Nelson Surfboards.’ The guys that put no money down on their boards got theirs first. If they paid in advance they had to wait. That was pretty standard in the industry. 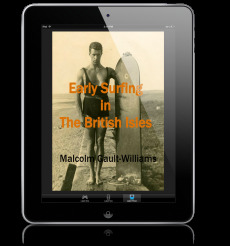 Curren was a little older than most of the coast haoles that came over in the great waves of surfer cross-pollination in the 1950s. His lifestyle honed by La Jolla surf culture (heavy Mexico/tequila emphasis), Curren set the tone for the establishment of Twentieth Century North Shore surf culture. Although he had done some work with Dale Velzy on the Mainland, Pat considers Hawai‘i is where he first got into shaping. Pat Curren became legendary on the North Shore of the late 1950s -- more or less against his will. “Ala King Arthur,” Van Dyke wrote, “the Knights of the Round Table and the meeting place known as ‘Meade Hall,’ Curren proceeded to convert [the] place in like fashion. He took on a number of roommates, mostly surfers from La Jolla, California, like Mike Diffenderfer, Al Nelson, Wayne Land and others. They razed all the inside separating walls, except the bathroom. With the lumber, they constructed surfboard racks from ceiling to floor, and built a huge rabble with connected benches on both sides. It stretched the length of the one big room. Later on, Meade Hall would see its demise. “Downing and Trent had helped establish Makaha as the No. 1 big-wave or any-size-wave spot in the Islands,” Noll wrote. “Up to this time, the winter of 1957, no one had ever ridden Waimea.” This was not entirely correct. Waimea had been surfed by the Hot Curl surfers in the late 1930s and beginning 40’s, but after Dickie Cross’ drowning there in 1943, the spot was considered voodoo and rarely -- if ever -- surfed. “One day in November, we stopped at Waimea just to take a look…” What the crew saw intrigued them, but Noll and company continued on to check Sunset, only later to return when they heard it was being ridden. “I was following Noll, Stange, Curren, Al Nelson, Mike Diffenderfer... and Mickey Muñoz...” wrote Fred Van Dyke, about the group that returned, after Schurch had left. “We always checked it because it looked so glassy and clean, but then [usually] drove on to Makaha. That day we stopped and got out of our cars. ‘Neat break, but a board racker,’ said Nelson. “When we first surfed Waimea,” Noll continued, “we weren’t conscious of making history, other than on the level of that particular time. For me the excitement came from competing with the other guys and from riding as big a wave as I was capable of riding... The irony was, at the end of the first day, when we were all sitting together rehashing our rides, everybody wondered, ‘Why the hell have we been sitting on the beach for the past three years?’ It wasn’t a huge break that day. Waimea was just trying to be itself. Later we were introduced to the real Waimea. “Even though I love ‘The Bay,’ I admit, deep down, the best part of surfing Waimea on a huge day -- one over twenty feet, which is not very often -- is when you are walking up the beach, thinking back over the waves, the wipeouts, the rip that takes you toward the huge boulders and threatens to smash you upon those boulders if you don’t make shore before the other side of the rock the kids dive from in summer. Yes, for me, walking up that beach, safe for another day -- alive -- is the payoff. “Greg Noll was the first to paddle out [from the group that had returned after Schurch left]. Whenever a place was tried for the first time, Greg usually stoked us to go out. On this particular October day in 1957, ‘The Bay’ was challenged for the first time by a group of Californians. Al Nelson, Pat Curren, Mike Diffenderfer, Mike Stange, Mickey Munoz and later, after school, by me. “‘The Bay‘ won, but a new surf spot was opened for exploration. The takeoff was nearly impossible, jacking up ten feet after you dropped in, and the wipeout in deep water so thick that you were held down long periods and pushed along for a hundred yards in thick soup. “On one of the years I was introducing the invitees to the Eddie at Waimea, I invited Harry to join me on the trip (at Quiksilver’s expense) and introduced him at the opening banquet to all the current day heroes. After he told his story they stood and gave this older scholarly looking gentleman a standing O, then the evening wound down, the crowd went home, and that was that. “Except that for Harry, who had been overlooked all those years, it was closure. He didn’t care about the act itself, called it overrated, no big deal, but, being a history teacher, it bothered him to hear the inaccurate versions go into the books. “The morning started with the surf just barely big enough to ride, and then by later afternoon, waves 25 feet and higher were hitting, with more water in them and more size than I have seen since I’ve surfed. “This was the big day,” continued Cole, “and everyone could sense it, and the air was filled with excitement. The lines were more definite than at any time during the year and Makaha was reporting its only point surf of the year. “The surf was inconsistent, with only one or two waves per set, but each was at least 10 feet in size. Diffenderfer took off on the first big one and dropped straight to the bottom. “Then Gebauer, who rode more waves than anyone that day because of an almost inhuman aggressiveness, took off way inside on a 20-foot-plus wave and Van Dyke on his outside rode extremely high and made the wave as Paul ‘souped out’ at the bottom. “The next big one,” Peter Cole went on, “supposedly the wave of the day and of the year, was one in which I took off on the inside, Pat on my side and Byron on Pat’s outside. The wave seemed large, but Waimea never seems as large to the rider as it does to the spectators on film. “On the wave, Byron’s edge caught and he fell over both Pat and me. The last I remember was seeing Pat ahead of me on the way out of a gigantic curl, while I was completely inside of the curl knowing that I didn’t have a chance. “Point waves become impossible to make after the waves moved into deeper water,” recalled Van Dyke. “The whole wall exploded over at one time from point to channel in one giant cataclysmic nightmare. Curren’s deal was being the taciturn “King of The Bay,” as he would later be called. He claimed Waimea Bay as his spot, in conditions and size that only the courageous could tackle. He was a loner, quietly going about his interests, rarely mentioned as a popular surfer, going virtually unnoticed in non-descript surf, and then suddenly appearing on the biggest monsters Waimea Bay could conjure up. Not only did he ride them, but he made them. Patrick King Curren moved back to California, to the Santa Barbara area this time, where he and Jeanine gave birth to three sons. The first boy, Tom, would go on to win amateur championships in the late 1970s and become a world champion professional surfer in the 1980s. As for Pat, himself, he did give up surfing for quite a long time, only taking it back up on a regular basis, in Costa Rica, in 1980. The Curren family broke apart in 1981 and Pat moved to Costa Rica. In 1988, he relocated to the southern tip of Baja, near San Jose del Cabo. “Pat and Tom surfed together in Costa Rica in 1985, while Joe joined his father and older brother for a surf trip to Ireland and France in 2000, but Curren family members have for the most part gone their own ways,” wrote surf writer Matt Warshaw in 2003, adding that “Pat Curren has had almost nothing to do with the nostalgia-tinged ‘surf legends’ revival of the ‘90s and ‘00s,” except to shape full-size replica balsa guns that, because of their price, are basically wall-hangers to those that can afford them. Living down on the end of the Baja Peninsula and divorced, Curren was ever still the loner. He filled “his life in simple ways,” wrote Bruce Jenkins, who visited him in the desert in 1994. He was still surfing, shaping, and doing a little carpentry work for surfers and non-surfers, alike, who moved down to the tip of Baja to build their dream homes. Eventually, Pat started another family, with the birth of a daughter in 2000. Surfing magazine, “Legend: Pat Curren,” Volume 29, Number 8. Pat Curren interviewed by Steve Yarborough, August 1993, p. 34. Surfing magazine, Volume 29, Number 9, September 1993, p. 43. Jenkins, Bruce. “Father, Son, Holy Spirit,” Surfer magazine, Volume 36, Number 3, March 1995, p. 75. Jenkins, 1995, p. 75. Peter Cole quoted. Surfing, August 1993, p. 34. Jenkins, 1995, p. 76. Pat Curren quoted. Jenkins, March 1995, p. 76. Jenkins, 1995, p. 76. Fred Van Dyke quoted. Surfing, August 1993, p. 34. Pat Curren quoted. Curren first on the North Shore, 1955 - Date derived from Phil Edwards account of his first trip to the Islands, when he was picked-up by Curren on the way to Makaha. See Ahrens, Chris. Good Things Love Water, A Collection of Surf Stories, ©1994, Chubasco Publishing Company, PO Box 697, Cardiff By The Sea, CA 92007. “A Belated Apology,” p. 5. Ahrens has Edwards’ first trip to O‘ahu in 1952, but Edwards wrote that it was 1955. See also Edwards, 1967, p. 61. Jenkins, 1995, p. 80. Pat Curren quoted. Jenkins, 1995, p. 76. Greg Noll quoted. Young, Nat. The History of Surfing, ©1983, Palm Beach Press, Australia, p. 79. Surfing magazine, August 1993, p. 34. Surfer Magazine, Volume 37, Number 8, August 1996. Note to the Editor, from Pat Curren, San Jose del Cabo, Mexico. Doyle, Mike. Morning Glass, The Adventures of Legendary Waterman Mike Doyle, ©1993 by Mike Doyle and Steve Sorensen. Manzanita Press, PO Box 720, Three Rivers, California 93271, p. 72. Jenkins, 1995, p. 77. Fred Van Dyke quoted. Jenkins, 1995, p.p 77-78. Peter Cole. Bob Sheppard’s last name incorrectly spelled “Shepherd.” Corrected. Jenkins, 1995, p. 78. Ricky Grigg quoted. Jenkins, 1995, p. 78. Peter Cole quoted. Doyle, 1993, p. 73. See also Jenkins, 1995, p. 77. Jenkins, 1995, p. 78. Bruce Brown. Van Dyke, 1989, p. 33. Jenkins, 1995, p. 77. Ricky Grigg quoted. Jenkins, 1995, p. 79. Bruce Brown quoted. Van Dyke, 1989, p. 33. Van Dyke places Meade Hall in 1957. Jenkins, 1995, p. 78. Fred Van Dyke quoted. Jenkins, 1995, pp. 78-79. Mickey Muñoz quoted. Jenkins, 1995, pp. 78. Greg Noll quoted. Date as marked in Surfers, The Movie. Pezman, Steve. Email to Malcolm, May 10, 2011. Van Dyke, 1989, pp. 31-32. Van Dyke, 1989, pp. 31-32. 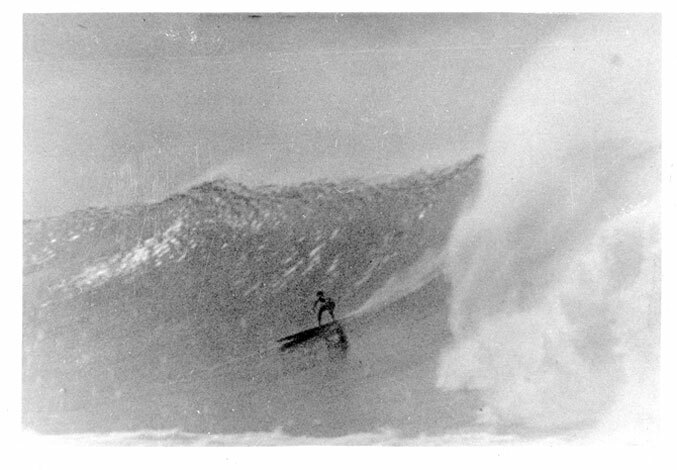 Fred has this opening up of Waimea in October of 1957. Surfers, The Movie, circa 1990. Greg Noll quoted. Van Dyke, 1989, pp. 84-85. Fred has it in October, but it was November 1957. Muirhead, Desmond. Surfing in Hawaii, A Personal Memoir, “With Notes on California, Australia, Peru, and Other Surfing Countries,” [1st edition], ©1962, Northland Press, Flagstaff, Arizona, pp. 118-119. Peter Cole quoted. Muirhead, 1962, p. 119. Peter Cole quoted. Surfer, Volume 33, Number 12. January 13-14, 1958 singled out for the waves that hit Makaha. Van Dyke, Fred. Thirty Years Riding the World’s Biggest Waves, ©1989 by Joseph Grassadonia, Ocean Sports International Publishing Group, Inc. 204 Poo-Poo Place, Kailua, Hawai‘i 96734, p. 74. Van Dyke, 1989, p. 73. Van Dyke, 1989, p. 75. Severson, John Hugh (1933- ). Modern Surfing Around The World, [1st edition], ©1964, Doubleday, Garden City, New York, p. 11. Fred Van Dyke quoted in the Introduction. Jenkins, 1995, p. 79. Greg Noll quoted. Jenkins, 1995, p. 79. Fred Van Dyke quoted. Jenkins, 1995, p. 79. Peter Cole quoted. Jenkins, 1995, p. 78. Bruce Brown quoted. Jenkins, 1995, p. 81. Pat Curren quoted. Surfing, August 1993, p. 36. Pat Curren quoted. Jenkins, 1995, p. 81. Jeanine Curren Bloom. The original Big Wednesday surf flick (not the Milius Hollywood movie) was released in late Spring/early Summer 1962 [Longboard Quarterly, Volume 2, Number 1, “Surf Movie Tonite! !” by Scott Hulet and Paul Gross, p. 71] and was a John Severson production made after he began Surfer Magazine, in 1960. Jenkins, 1995, p. 81. Jeanine Curren Bloom quoted. Jenkins, 1995, p. 80. Sam George with Jeanine Curren Bloom quoted. Jenkins, 1995, pp. 81-82. Jeanine Curren Bloom quoted. Jenkins, 1995, p. 80. Sam George quoting Pat Curren. Warshaw, Encyclopedia of Surfing, ©2003, p. 144. Jenkins, 1995, p. 83. Greg Noll quoted. Jenkins, 1995, p. 83. Ricky Grigg quoted. Jenkins, 1995, p. 83. Fred Van Dyke quoted. Jenkins, 1995, p. 83. Pat Curren quoted.